So, we had the situation where we needed to use a multidimensional array within AX. AX can only handles a single dimensional array, and using the .NET classes, caused some issues when with type conversions. Eventually we ended up creating a Class. The example below creates a 3 dimensional array. To test, just run the main static method. Cause: A Full CIL or Incremental CIL might be running, causing this error. Project managers and clients don’t really understand the complexities of upgrading an environment to a new Roll-up / CU version. Well, how difficult can it be? And why can’t it be done right now? Well, usually it is not a problem. As a developer you compare your code, if changes were made on existing objects and make sure you merge the new code with your code. And everyone is happy. However, what happens when you have other partner products on your AX Environment. What if those products were build for a different Roll-up / CU version. Now suddenly it becomes a whole lot more complicated to do the upgrades. At some of our clients, we have had to merge code over 4 to 5 layers. You can easily lose your head with a merge, especially with methods that are quite large. We received a request from the client to upgrade to the latest CU version (CU10) ASAP. We notified the client that not all of the partner products are available on CU10. Our client told us to still continue with the upgrade. With the upgrade, Microsoft made some changes the the SYP layer. As part of the merging process, a developer usually compare the first layer in our case the CUS layer, and the layer just above it, i.e. VAR layer in this example. However, by doing this we are missing out on any changes that might have occurred on the SYP layer, thus causing compile errors, because the variable for the SYP layer was never linked in the code. Well, what is the problem then. Well, in some environments we have code changes in methods that have 100s of lines of code. You then have to compare your custom code with the changed layer (SYP), compare it with the changes on the ISV, ISP, VAR, VAP layers (and yes we do have clients with these setups). And finally you have to apply the combined merge on your CUS Layer, which can get quite complicated, especially when the changes were not property commented in code. remember now, the ISV, ISP, VAR and VAP layers also contain their own code custom code, which was created for an older CU version. You can not easily identify the SYP changes, because it might actually changes on top of the SYP layer, which will not provide you will a clear indication of the change. Wait for all products / to be upgraded before you try to upgrade your own code to the new Rol-up / CU version. That way you will not have to try and figure our code changes over multiple layers. 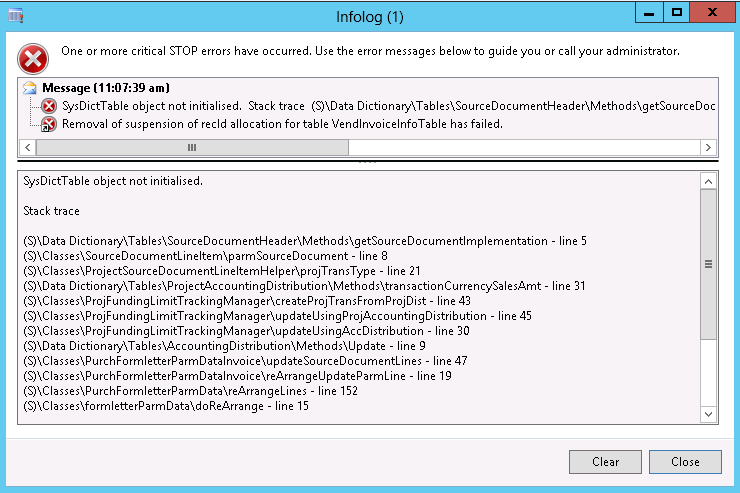 Error Message (03:26:41 pm) Removal of suspension of recId allocation for table VendInvoiceInfoTable has failed. Download and install hotfix 2909584. Install and recompile for all class changes to take effect. Also do a Full CIL compile. The code is executed within via the CIL. There is also some upgrade script that need to be executing, so make sure you complete the checklist. Resolving issues with the integration of Microsoft Project Server 2010 and Microsoft Dynamics AX 2012 can be sometimes very difficult, especially if you do not know where to start looking for the issues. That is why I’ve created this document, to help basically myself the next time I need to fix and Integration. i. Failed to provision site PWA with error: Microsoft.Office.Project.Server.Administration.ProvisionException: Post provision setup failed. —> System.Reflection.TargetInvocationException: Exception has been thrown by the target of an invocation. —> Microsoft.SharePoint.Upgrade.SPUpgradeCompatibilityException: There is a compatibility range mismatch between the Web server and database “ProjectServer_Published”, and connections to the data have been blocked to due to this incompatibility. This can happen when a content database has not been upgraded to be within the compatibility range of the Web server, or if the database has been upgraded to a higher level than the web server. The Web server and the database must be upgraded to the same version and build level to return to compatibility range. a. Error Message: “An unexpected error has occurred. Within the Browser, when accessing the Projects Website. An error occurred while creating the Project compound entity of EntityId:0cfcb10d-4053-4281-a42f-d0bcde7a13e3, Name:”EXCHANGE SERVER” in project server. 1. Check in all Objects on the Project Server. 2. Within Integration log, Click Action, Resynchronize. An error occurred while creating the Project compound entity of EntityId:d48e03fe-15f4-48a5-88a9-1859b8ca0e3a, Name:”HR” in project server. 1. Within Integration log, Click Action, Resynchronize.